Okay, my trip is still more than seven months away, and I’m obsessing about luggage. I think it’s because it’s a tour, and I don’t have any other plans to make. Still, I’m pretty sure I’ve taken it too far. 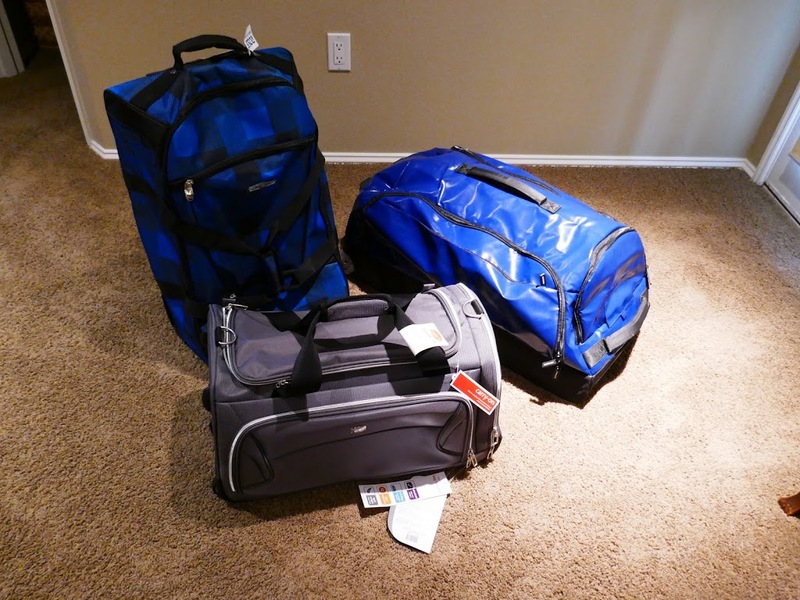 I returned the bag I got from eBags. I decided it was too big. And I’ve bought three new bags, one of which will definitely go on the trip with me. So here’s the scoop on each of them. This was the cheapest of the bags. I got it at Ross for $26.99. It is very lightweight, and roomy at 4278 cubic inches. 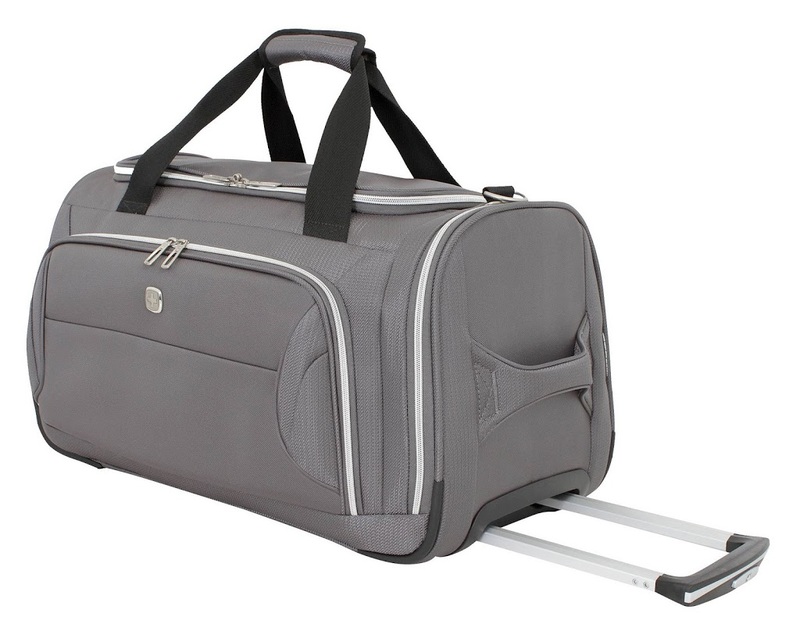 Although they call it a duffel, it isn’t as tall as a typical duffel. The dimensions are 24″ x 11.5″ x 15.5″. Other than the main compartment, there’s a mesh compartment on the inside of the cover, and two compartments on the outside.Advantages: I like the configuration. 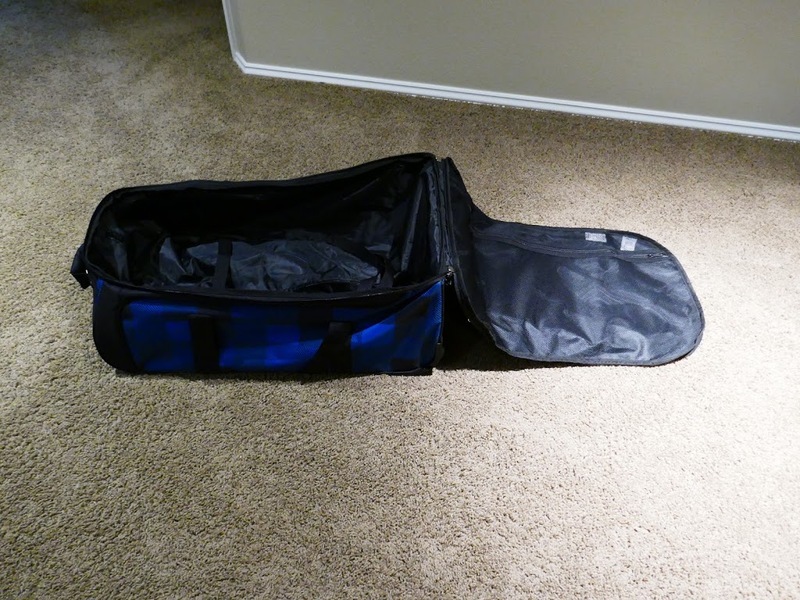 The shallower, wider layout means it will be easy to find things in the bag. I like that it’s lightweight. 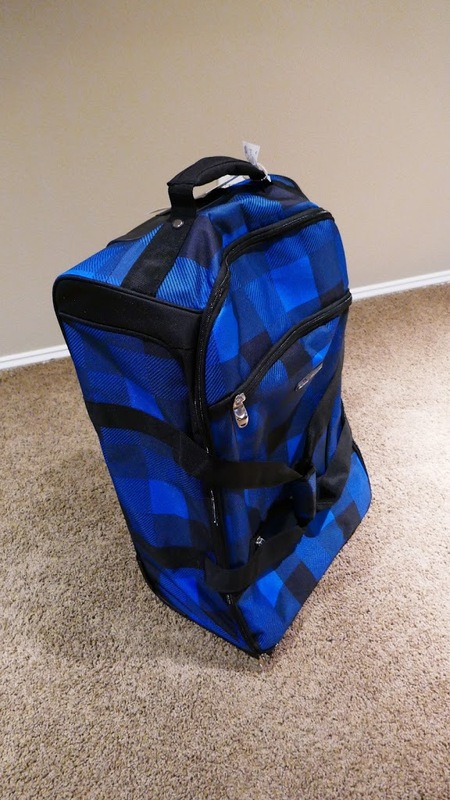 And while I don’t love the plaid, it should be very easy to find on the baggage carousel. Disadvantages:None, except because it’s so inexpensive, I’m worried it might be cheaply made. With all the flights I’ll be taking, this bag could get lots of abuse. If a wheel falls off or a seams rips, I’m screwed. At $64.99, this seems like the most bag for the buck. It feels very well constructed, though it’s also a bit heavier than the others. It’s also the biggest at 4500 cubic inches. The dimensions are 29.5″ x 13.5″ x 14.5″. 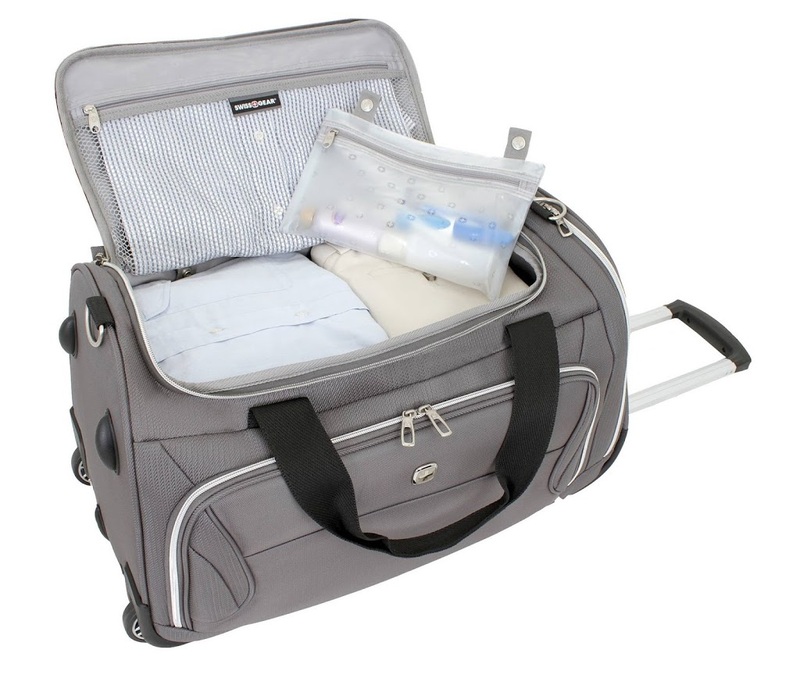 Unlike the typical duffel bag, it opens on both sides rather than on top; there’s a zipper divider down the middle. This ostensibly makes it easier to find things without having to dig too deep. In addition to the (optionally divided) main compartment, there are mesh compartments inside both flaps, and there are two compartments on the outside, one in front and one on one side. Advantages: Waterproof and easy to clean. Bright green interior makes it easy to see things inside. Seems sturdy. Easy to identify on the baggage carousel. Disadvantages: Possibly bigger than I need, encouraging me to overpack. This is the smallest of the three; also the most expensive, at $99.99. The dimensions are 22.5″ x 12.5″ x 11.5″; I don’t know the interior capacity, but that should come to about 2900 cubic inches. 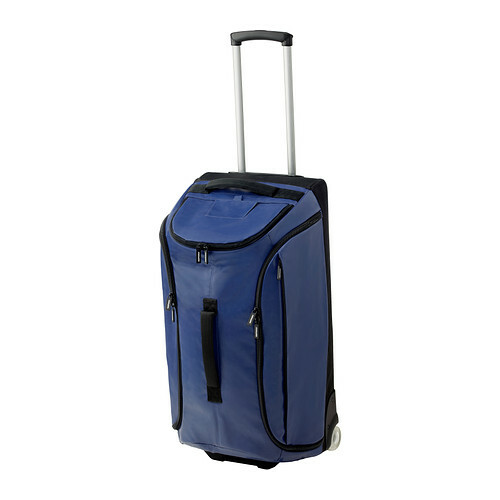 Of the three, this is the only one that feels like a traditional wheeled duffel, so it’s deeper, making it hard to find items at the bottom. 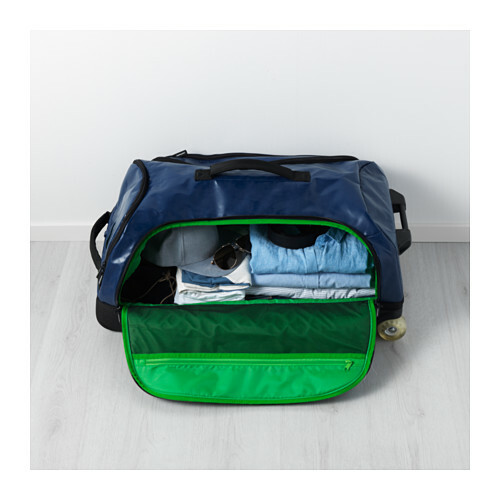 It has three exterior compartments — one at the top and one on either side, plus a mesh compartment on the inside of the cover and a removable wet bag. Advantages: Smaller, encouraging me to pack lighter. Seems sturdy. May not stand out on the baggage carousel, but shouldn’t be hard to spot. Disadvantages: Smaller, maybe not big enough to fit everything. I will likely try to use the SwissGear bag if it will hold everything I want to bring. Otherwise, I will see. IKEA has a 365‐day return policy, so if I don’t end up using it, I can bring it back. And Target might accept the return even though their policy is 90 days; at the very least, I might be able to get a store credit if I decide not to keep it. The cheapo, from Ross, well, that’s a size and style I can definitely use sometime, so I’ll probably just keep that one no matter what.